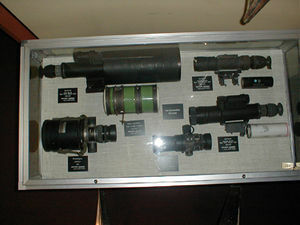 Night vision devices (NVD) use various techniques to allow a person to see under what otherwise might seem dim or totally dark conditions. NVD, often in the form of night vision goggles (NVG), is an unfortunate term, because, in military usage, NVD/NVG refer to specific technologies for viewing. The first generation were active, illuminating targets with an infrared light source. Passive "NVD", also called "starlight scopes", amplify low levels of visible or infrared light, such starlight on a moonless night, but will not work in a truly darkened building or heavily covered area outside. When operating in the visual range, they are called low-light television. Passive infrared viewers of this generation and the next may also be called forward-looking infrared. Third-generation infrared thermal viewer devices detect the heat from the target, such as a living body or an engine, and need no external source of light in any wavelength. Some of the limitations of this technology were that the infrared illuminator could require substantial electrical power, yet had limited range. Ranges from 100 to 400 yards were typical, with a black-and-green image. One WWII telescope and light source weighed approximately six pounds, but the necessary battery brought the total weight to 21 pounds. A Korean War version had a much sharper image, but a total weight of 28 pounds without greater range. Further, while the illumination was invisible to the unaided human eye, to an enemy looking through a viewer, the illuminator showed up brilliantly, making its user a target. The next generation no longer needed a light source, greatly reducing the weight and increasing the battery life. They worked by amplifying very small amounts of visible or infrared light, such as starlight on a moonless night. Still, they did depend on a natural source of light, so they stopped working in buildings or under heavy cover. Still, some objects may not be very reflective, so combat aircraft, the B-52 again being an example, have the LLTV and FLIR side-by-side. Forward-looking infrared devices of this class principally work in the near-infrared; it is the next generation that goes into the mid- and far-infrared. The U.S. versions of the passive amplifiers were made with more flexible clamps, so they could go on a standard rifle or used as a standalone viewing device. The AN/PVS-1 Night Vision Sight “Starlight Scope” reduced the weight dramatically, to 8 pounds, and went into service in 1965. It suffered from the problem of being "dazzled" by bright lights, which included flares and fires on a battlefield. Battery life, which had been short for the active systems, increased to 100 hours. By 1969, the AN/PVS-2 cut weight down to 6 pounds, had longer battery life, and was not dazzled by bright light. Low-light television (LLTV) work in the visible spectrum alone (or possibly near infrared), but lend themselves to display on a screen rather than goggles or a telescope-like sight. A number of aircraft, such as the the B-52, carry LLTV such as the AN/AVQ-22. Obviously, an airplane will not fly indoors, so the problem of not having skylight never occurs. Pilots of MH-53 PAVE LOW special operations helicopters often wear NVG. If the device has light detectors sensitive to different colors (e.g., red-blue-green) LLTV gives color images, as opposed to the monochrome of passive NIR.It thus can provide more information, as well as sharper views than a passive infrared viewer that uses longer wavelengths. By going to shorter wavelengths of infrared light, third-generation IR NVD does not depend on reflections, but on the heat internal to a device. This still may pick up a metal object against earth, as the difference between the heat-conductive metal and the more insulating earth will be obvious. A tank engine, even hours after being turned off, still is hotter than the ground. This page was last modified 09:05, 13 March 2011.